Easter is just around the corner! My kids have had notes to the Easter Bunny taped up on the window since the first week of January. To say we are excited over here is an understatement. 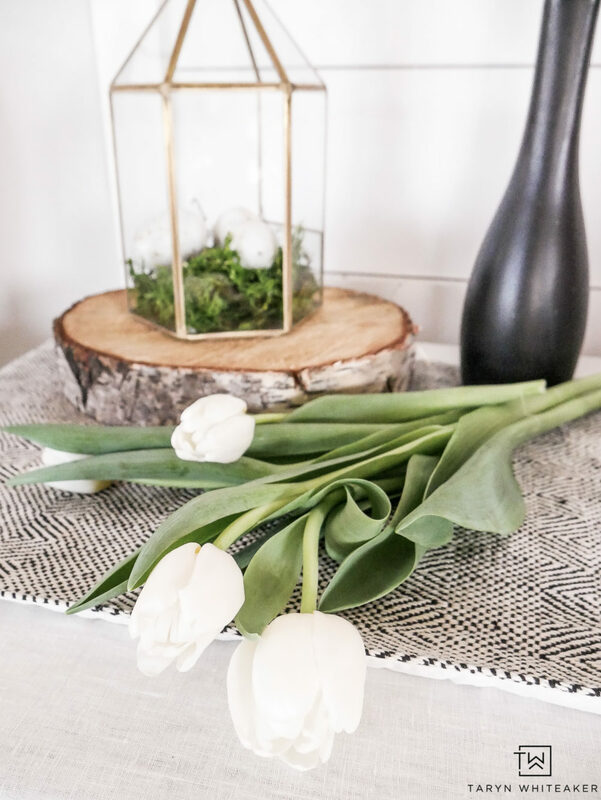 This week I’m kicking off tons of Easter and Spring ideas you can easily incorporate into your own home. My number one rule, FLOWERS! 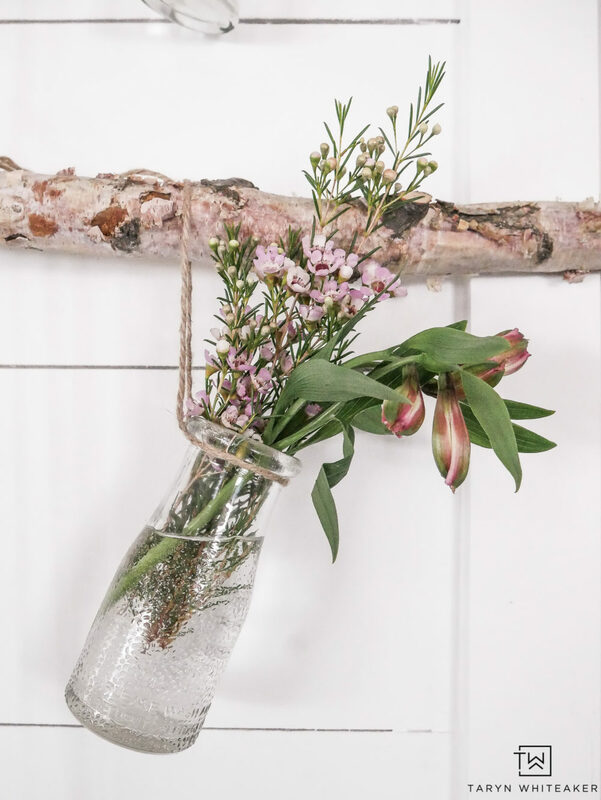 This is the time of year when I want our house filled with fresh greenery and pops of bright flowers. While I typically don’t use a ton of color in my designs, I love bringing it into our home through natural elements. 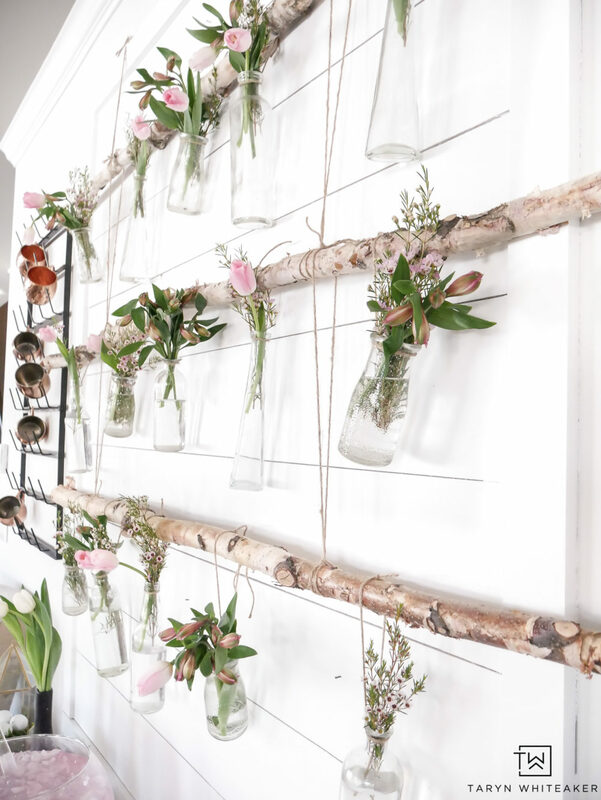 I spent some time playing around with fresh new spring ideas last week, and today I’m giving you a peek at my DIY Hanging Floral Backdrop! 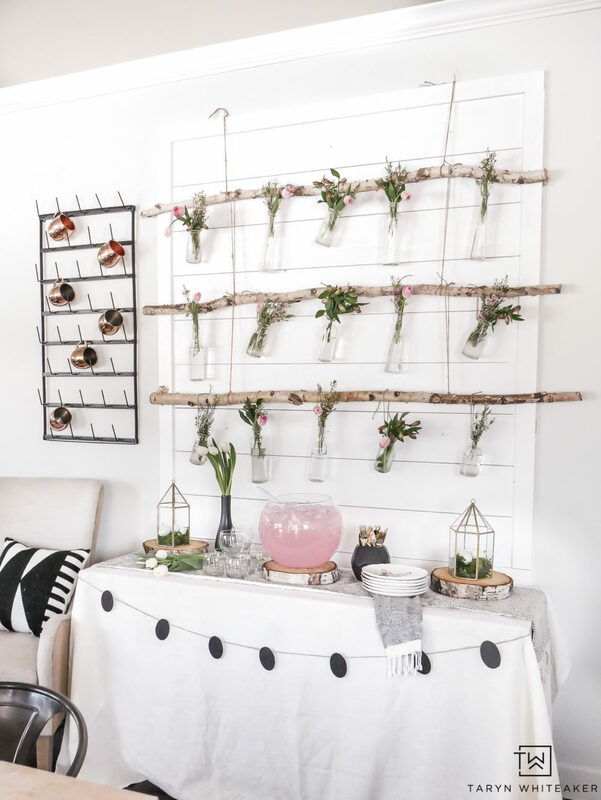 Our shiplap display in our dining area is my favorite place to dress up for the different seasons. 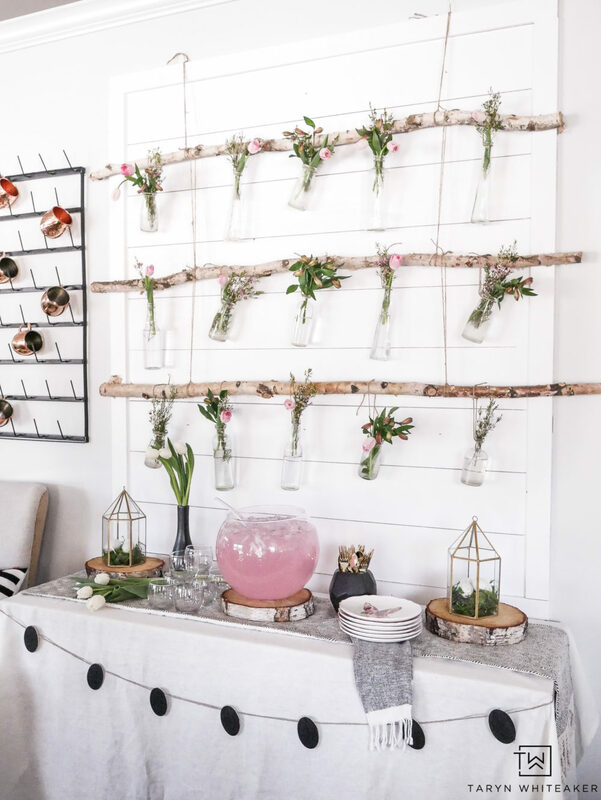 It makes for a great party backdrop whether it’s a simple dinner or big party. 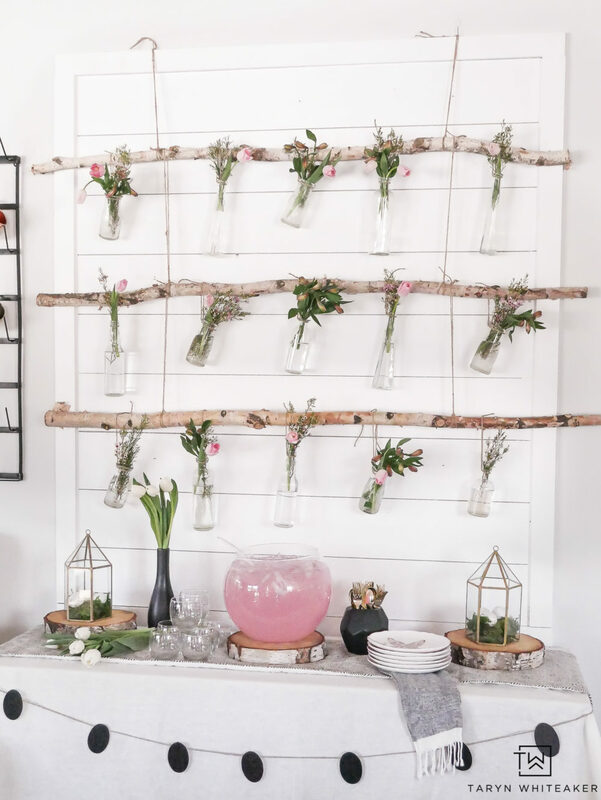 I came across a picture of a similar branch display on Pinterest, it was either from Urban Outfitters or Anthropologie, I can’t find the original but I loved it so much and I though it would make a great addition to our Easter Entertaining area. Putting it together was super easy! 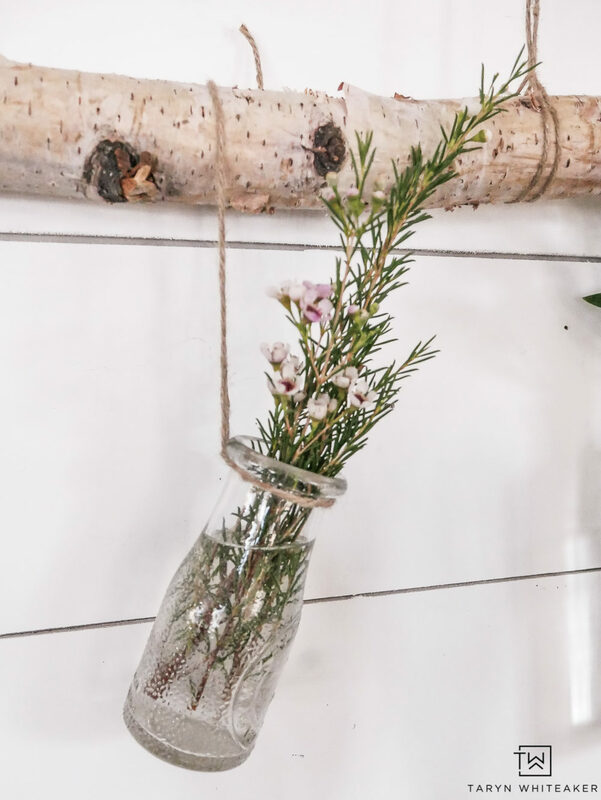 It took one trip to the craft store where I purchased the three birch branches, a variety of glass jars (some even from the Dollar Store) and some jute. I strung the whole piece together and hung it from the top of the shiplap. Last step was fresh flowers from the grocery store! Picking the flowers for the display is the finishing factor. Depending on the colors and texture you decide, will completely change the look of your display. 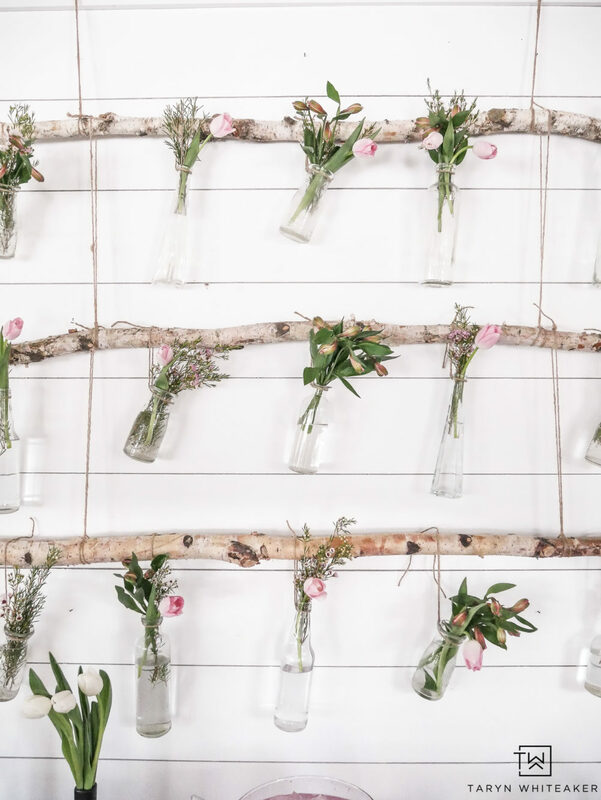 I wanted mine to be full of whimsical greenery and pops of pale pink or a subtle look. I want it to be sweet and charming and very spring. 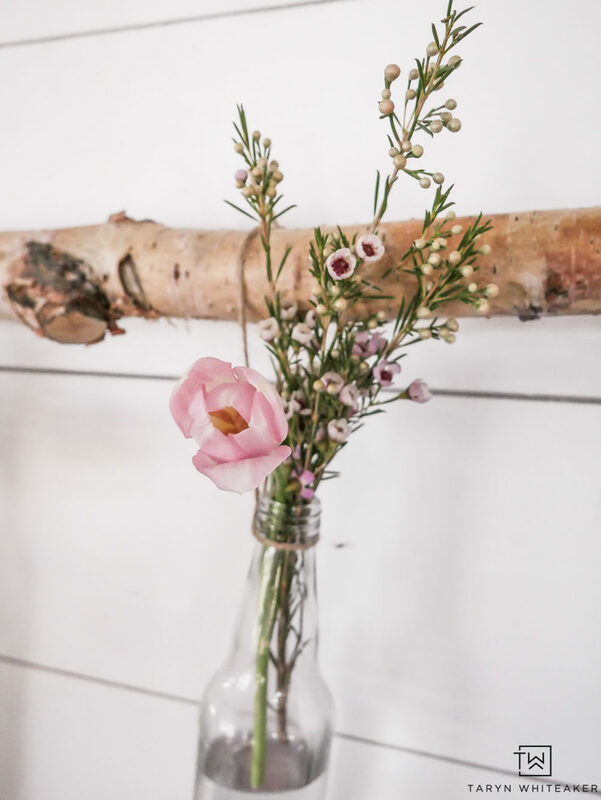 I found these Pink Geraldton Wax Flowers at the store and loved the look of them. So simple and famine but also very ‘straight from the garden’ type of feel. 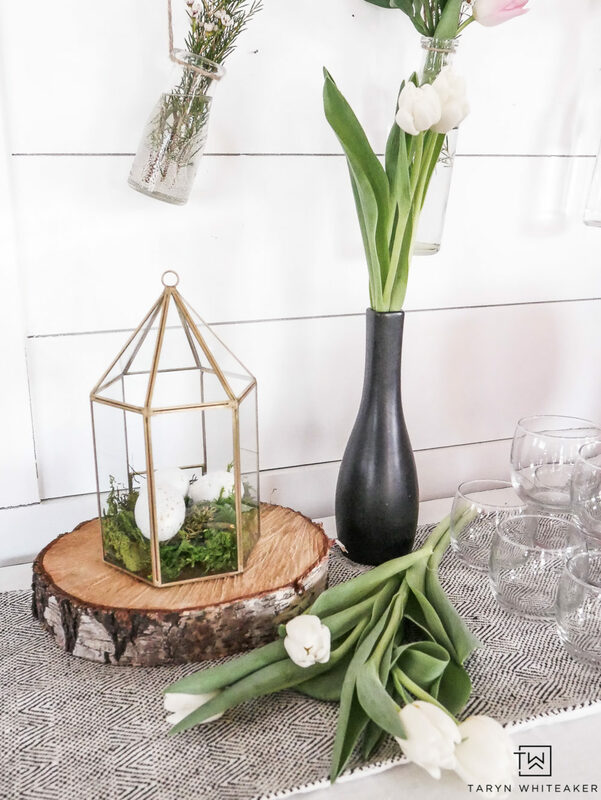 This display is great for spring, but also transitions great into Easter! 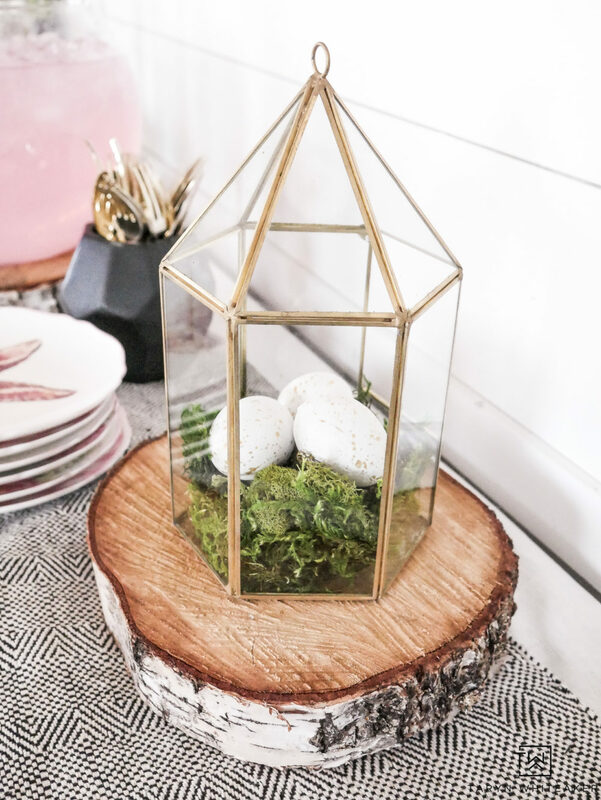 To give it a little more of an Easter feel I added these DIY Easter Egg Terrariums. I live in Geraldton Western Australia so I am delighted to see the local flora in your design. Unfortunately its going into autumn here and no geraldton wax in flower at the moment. This project has a lot of “wow” factor! I never would have thought of putting the elements together, but I’m thinking about doing something similar (probably with fake flowers). 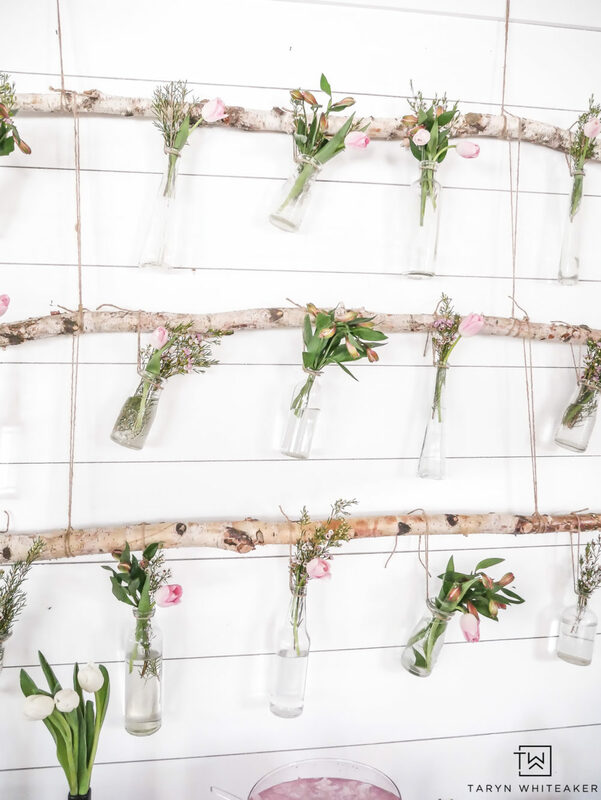 The hanging floral backdrop is a bit of work with the fresh flowers but it looks gorgeous! Thank you! And yes it was a bit of work, but great for a special occasion! You have a natural way of making enchanting displays which are different, one of reasons I so enjoy your blog so much. Can imagine this wasn’t easiest display to execute but worth your trouble I hope. I love it,so gorgeous while natural.